Inflatable stand up paddleboards are perfect to take around the islands. Stand up paddleboards (SUPs) are easy to use, and are a fantastic way to connect with the beautiful scenery on the Isles of Scilly. Anyone with a moderate fitness level can have a go and master the basics in a short time. No previous experience is required to hire SUPs. They are generally for use in close proximity of our centres and in sight at all times. They are very stable and easy to use, making them a great introduction to water sports with virtually no instruction required. 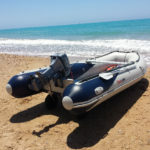 It is possible to leave the immediate area of the centres teaching bay on exceptionally calm days and only with the express permission of the beach manager. 1 Hour Taster session £35 private session or £25 per person group session.